The Norfolk terrier dog breed was first bred in East Anglia, England. The Norfolk and Norwich Terriers used to be the same breed with two different ear types both were called as the Norwich Terrier. The Norfolk Terrier is a powerful, firm short little dog. The head is to some extent rounded, wide with a good amount of space between the ears. The wedge shaped muzzle is strong, with a well-defined stop, The small oval shaped eyes are dark in color. The ears are small, hanging tight to the cheeks. The legs are straight and the feet are round with black toe nails. The agile, straight coat is about one and a half to two inches long. Coat colors include red, wheaten, tan, black and tan, or grizzle with or without dark points and sometimes with white markings. 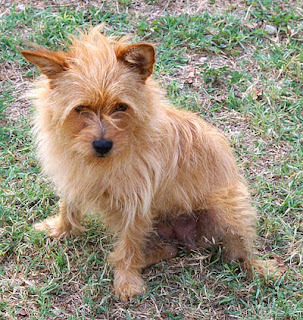 The Norfolk Terrier is among the smallest of the working terriers. Active, adventurous, loving and balanced and without any nervousness. They are easy to train. These little dogs love everyone and are good with children. They are not trusted with small pets but they are good with them. Norfolks will do okay in an apartment if it is sufficiently exercised. They are fairly active indoors and will do okay without a yard. As far as grooming is concern The shaggy, medium-length, waterproof coat is relatively easy, but daily combing and brushing is important and bathing can only be given if its needed. They are eager about doing work, they need daily walk so it is important that this breed of dogs is taken on a daily walk by its owners. The Norfolk terrier dog breed is usually a healthy breed with almost no diseases affecting it on a regular basis. Some lines of the breed however are prone to back problems and genetic eye diseases. This breed of dogs lives for between 12-15 years and is one of the smallest terriers in the world.